The assumption in most high-level professional exotic open-wheel automobile racing is that one has to qualify their car faster than anyone in order to achieve a good result. The well funded multiple car super teams always are able to out perform and dominate because once the favorable top order starting positions are filled, the race can feature great control with little passing and the wins and points all go to the best qualifiers. At the 2014 Shell and Pennzoil Grand Prix of Houston this template was thrown out of the window save the points garnered for the season's championship race. The two race weekend highlighted everything that is great about American open-wheel racing and did this under all weather conditions. Rookies, relatives, and relocation drivers were the stars while drivers of the so-called super teams of Penske, Ganassi, and Andretti were pushed aside (figuratively and literally) of the limelight at race's end of Race 1/Round 9 on Saturday and Race 2/Round 10 on Sunday to deliver the most entertaining weekend of any racing series in this world in recent memory. At the halfway point in the Verizon IndyCar Season, one would like a bit of clarity from season points leaders after the strength of the last three races shown by Penske Racing, but none was coming at the 2014 Shell and Pennzoil Grand Prix of Houston [Twitter idents: @MtrsprtsJournal @TheEDJE #IndyCar #GPHOU]. Through the previous practice sessions, Will Power showed that he had the stuff to tame the track. He ended up with the second fastest lap time just behind Schmidt Peterson Motorsports standout Simon Pagenaud. When it came to the three dry weather knock-out qualification sessions for the Firestone Fast 6, however, season points leader Power could not advance out of Group 2 to the top 12. As for Simon Pagenaud, he was able to grab his first ever pole award in the Verizon IndyCar Series. Power, starting from deep in the field at P18 of 23 cars, stated the blame was his fault on the dictated set up of the car ... “Definitely not starting where we would like to be but we just have to go out there and see what happens and hope the Chevy can make its way to the front,” Power said. "It's a much more difficult track to come from the back, but in IndyCar races anything can happen." When it came to race time, rain had Race Control declare a Wet Start ... and soon after the Dallara DW12's roll out on the improved temporary parking lot/street track to warm-up for the planned standing start, the race was further declared a timed event at one-hour and fifty minutes (1:50.000). 1. I thought I was more likely to win an IndyCar race this season than Carlos Huertas. Nine races and he is an IndyCar winner. A guy who's lone victory in Formula Renault 3.5 came in a monsoon. A guy who was rumored to be the sugar daddy savior for Panther Racing over the winter and now he was more wins this season than the four Ganassi drivers combined. It may takes me six months to wrap my head around this victory. 2. 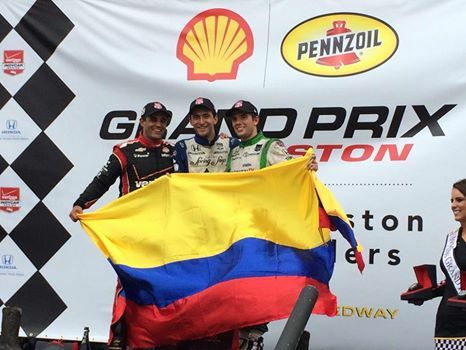 And Colombians finished 1-2-3 with Juan Pablo Montoya and Carlos Muñoz rounding out the podium. They used strategy to perfection in this timed race. They stopped at the right time when they knew they could make it to the end while the leaders stayed out. Not to mention Colombia advancing to the quarterfinals in the World Cup with a 2-0 victory over Uruguay. They will play Brazil on the 4th of July while these three go at it again tomorrow. 3. Graham Rahal had a day that started out from hell, appeared to made it out alive, only to be dragged right back down after getting into the back of Tony Kanaan before going green. What else could go wrong for Rahal Letterman Lanigan Racing? Luca Filippi was running well before slapping the wall on a restart due to cold tires. They can make it all up tomorrow but it will be difficult to recover from the way today ended. 4. Any other day and Sébastien Bourdais, James Hinchcliffe, Jack Hawksworth, Ryan Hunter-Reay, Marco Andretti and Hélio Castroneves are the top six. Andretti of all people probably had the race of the day. From being spun by his teammate Muñoz to being black flagged for running competitive laps to then leader Takuma Sato and the Japanese driver failing to get by the American to recovering and being one of the half dozen caught out on pit strategy. Keep your eyes on all six tomorrow. 5. Justin Wilson finished tenth (at least I think he will after Graham Rahal and Ryan Briscoe are assessed their penalties) and did 46 laps on one stint. Huertas did 39 laps to make it to the checkered flag. I don't know what Dale Coyne Racing did to their cars over the break but it appears to have worked. Great job by the whole team. 6. This was a day that appeared to be one where Castroneves, Hunter-Reay and Simon Pagenaud could catch up on Will Power as he started eighteenth and was a non-factor all day before sliding into the tires, ending his run of completing every lap in 2014. But, with the likes of Pagenaud, Mike Conway, Charlie Kimball, Scott Dixon, Luca Filippi and Takuma Sato having problems, Power finished fourteenth and only lost six points over Castroneves in the standings. Things are falling Power's way in 2014. 7. I hate to think that this race could have ended better. It was a timed race and I enjoyed it. They did the hour and fifty minutes like they said and I should take that. But after being so close to a green flag finish and having the Rahal-Kanaan contact deflate the balloon stinks. Who knows? Maybe Huertas would have won anyway but what could have been? 8. Tomorrow's race will be nothing like today's but what a race it was. My jaw is still on the floor. Everyone get some rest, rehydrate and we will dance again tomorrow. By the way, there are no Dutch, Mexican, Costa Rican or Greek drivers in the race, so no IndyCar/World Cup double like today. Caution flag is out due to a spin and stall after catching a puddle by Will Power - Time Remaining in Race: 27:080. Power was the only driver to complete every lap in 8 races but with this spin, no more drivers will have "perfect attendance" in 2014. With 11 minutes remaining, an Englishman (Justin Wilson) was being chased by four angry Colombians - Huertas, JPM, Kanaan and Munoz! Note - Justin Wilson had to pit on Lap 74 for fuel ... so much for anger. Car 8 - Ganassi's Ryan Briscoe and 15 - Rahal Letterman Lanigan's Graham Rahal received 30-second penalties for avoidable contact with Josef Newgarden and Tony Kanaan respectively. On Sunday, in a two session of Group A and Group B qualifications process where the drivers go out on track and pray for at least one clear lap in a few short minutes - about enough time for three laps after one out-lap - times posted are fanned into each other, every other position, starting from the fastest time from the group that this time was posted. Example: Say Group B had the fastest overall time, so, P1=B, P2=A, P3=next fastest B, P4=next fastest A ... and so on, and so on. Penske Racing's Helio Castroneves gained a point by winning the pole for today's race (3:45 p.m., NBCSN). Castroneves gained only six points on Power on Saturday when he finished ninth as Power finished 14th. The pole is the 40th of the Brazilian's career, tying him with Penske Racing's team manager Rick Mears as being only five drivers to achieve or surpass this mark on IndyCar's all-time list. 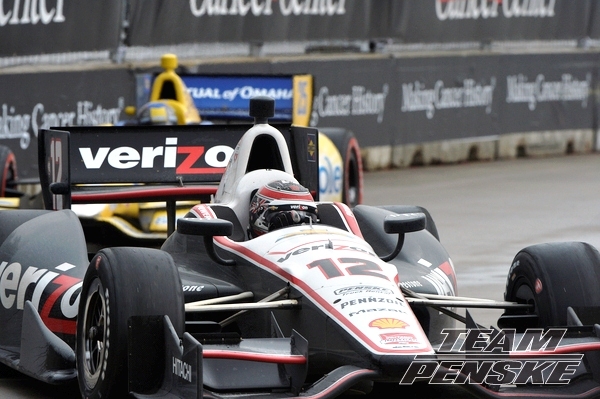 Penske Racing team-mate Will Power, again qualified poorly and ended up with the same starting position as Race 1 - P18. His lead over Castroneves at the season's halfway point is 32 points. 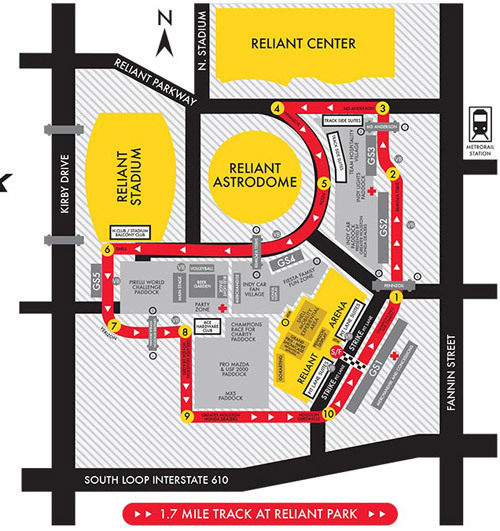 In this 90-lap race, run in hot and humid conditions at Houston's NRG Park, Helio Castroneves from Team Penske started on the pole and led 47 of the first 48 laps, but Pagenaud overtook Castroneves for the top spot on lap 49. Pagenaud had led one circuit earlier during a round of green-flag pit stops. Later on that same lap, Castroneves tried to catch Pagenaud but bumped into Sebastien Bourdais and then made contact with the wall near turn 6, ending his race. Castroneves wound up finishing 21st, as he lost an opportunity to narrow the points gap between him and leader Will Power, his teammate. "When I lost the lead with Pagenaud, I was trying to pass him, but I had no idea [Bourdais] was there," Castroneves said. "When I'm attacking, I can't have eyes in the back of my head. It's absolutely ridiculous when the guy has to put the car over there. But anyway it's the rules of traffic...I'm upset because we had a great car. There were  laps to go, and I wasn't panicking. It is what it is, and I'll move on and see what happens." Power started 18th for the second day in a row but had moved up to third before he sustained a broken rear suspension in the closing laps. He limped across the line in 11th. Power's point advantage over Castroneves is now 39, the same margin between the two entering the Houston doubleheader. "We were in position for a good day, considering where we had qualified," Power said. "We were going to maximize our points, but we had a parts malfunction with two laps to go. We fought really hard all day with nothing to show for it." Ryan Hunter-Reay, Juan Pablo Montoya, Ryan Briscoe, Marco Andretti and Tony Kanaan finished sixth through 10th, respectively. 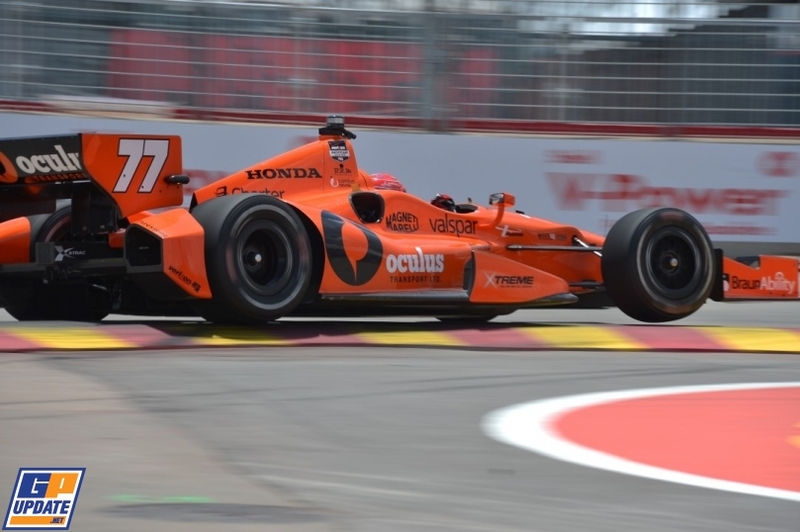 One day after scoring his first career victory in IndyCar, rookie Carlos Huertas completed just two laps before he experienced an electrical issue, as he stalled on the track. Huertas finished last. Pagenaud went on to lead the final 42 laps and crossed the finish line 7.2622 seconds ahead of Aleshin. The Frenchman scored his first win of the season in the May 10 inaugural Grand Prix of Indianapolis, held on Indianapolis Motor Speedway's road course. In Saturday's rain-soaked Race 1 in Houston, Pagenaud started on the pole but ended up finishing six laps behind in 16th after he struggled with brake issues in the early going and then was involved in a multi-car crash during the mid-stages. "Awesome race," said Pagenaud, who won for the fourth time in his IndyCar career. "The car was just beautiful. Awesome braking. Awesome traction. Awesome grip. What else could you expect as a driver. That's why I was so disappointed yesterday." Aleshin's race on Saturday ended on lap 33 when he made contact with Takuma Sato and crashed into the turn 6 barrier. The Russian finished last in the 23- car field. "I can't really explain my feeling. I just have so much emotion," Aleshin said after his runner-up finish in Race 2. 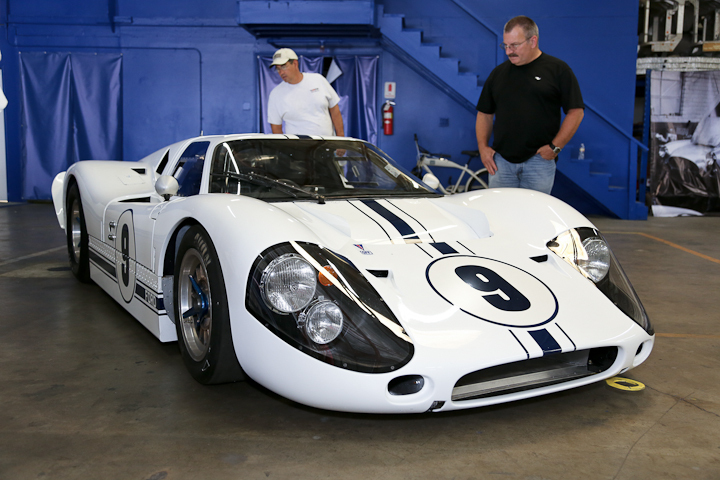 "I had a flat tire on my car in the last few laps. I was really lucky to finish, actually. I'm very happy. The team did am amazing job. I don't have enough English words to thank the team for that." Schmidt Peterson Hamilton Motorsports claimed its first ever 1-2 finish in the IndyCar Series in Sunday's Race 2 of the Shell and Pennzoil Grand Prix of Houston weekend doubleheader. Simon Pagenaud captured his second win of the season, while his rookie teammate, Mikhail Aleshin, finished a career-best second. Rookie Jack Hawksworth earned his first career podium finish in IndyCar with a third-place run, while Charlie Kimball took the fourth spot. Bourdais suffered a broken front wing during his incident with Castroneves but rebounded for a fifth-place result. #IndyCar What a great 2 days of racing. Awesome race today. Can you put another race on tomorrow? As stated before ... probably the best and most entertaining weekend of any racing series, in this world, in recent memory. 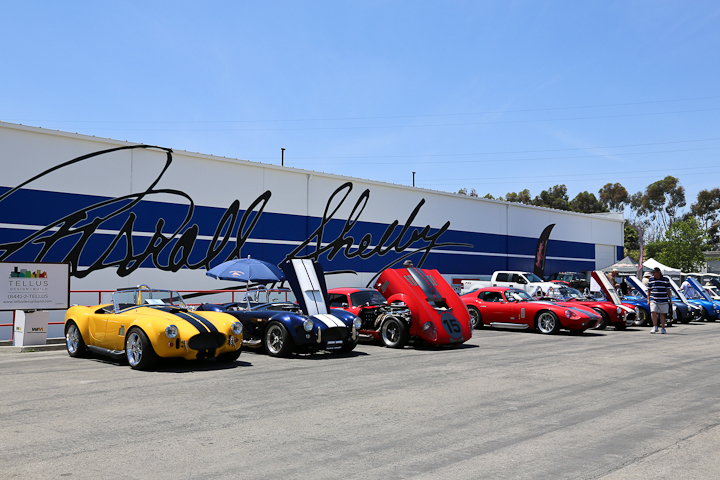 The weekend of May 17, 2014 was a big one for Carroll Shelby fans in the greater Los Angeles area. 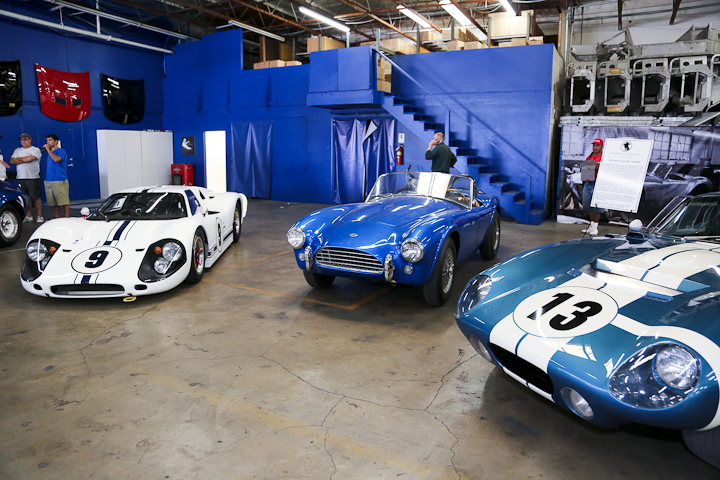 The single day event took place at the new home of the Carroll Shelby Automotive Museum at 19021 S. Figueora Street, Gardena, California. 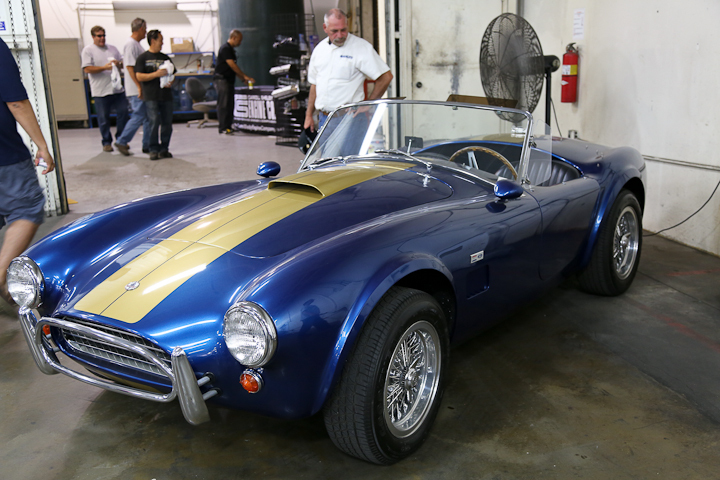 It featured at least one original example of the cars produced during the life of Carroll Shelby. 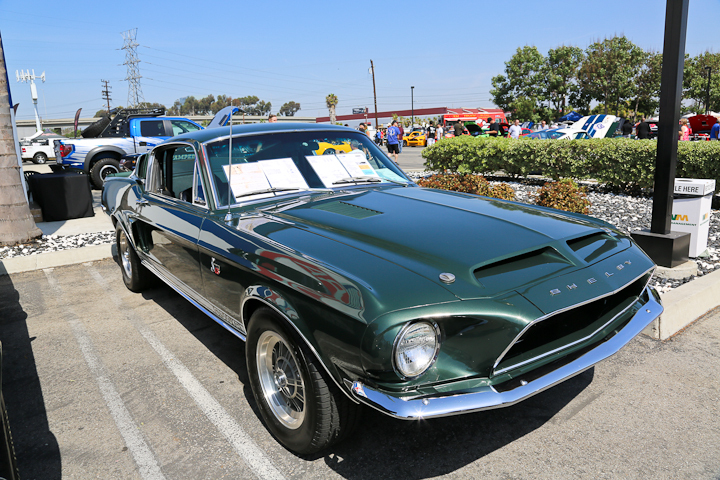 The only models that appeared to be absent were the Toyota 2000 GT, and the Dodge powered Shelby’s. 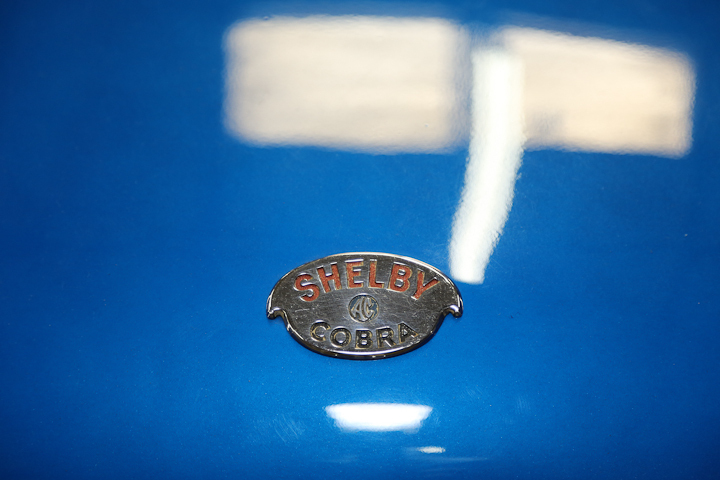 Did you realize that Shelby had a hand in these? 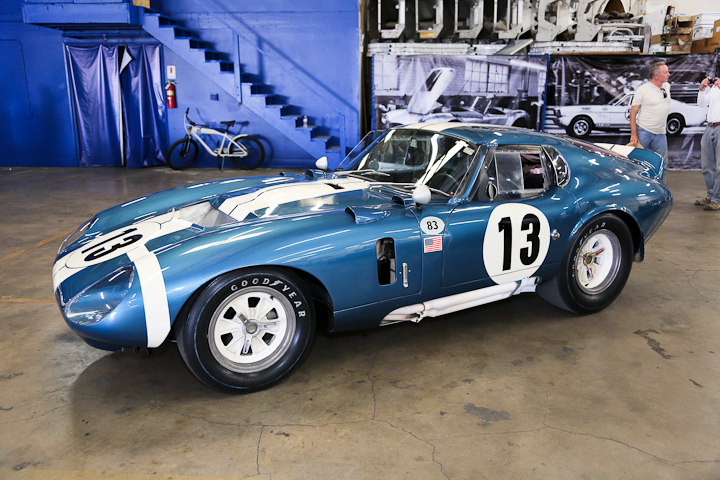 Featured speakers included the legendary Bob Bondurant who was a factory team driver and co-drove with Dan Gurney the 1964 Le Mans winning GT class Daytona Coupe; A.J. Baine a journalist and author of “Go Like Hell”; Lucas Foster a film producer; Lynn Park an avid Cobra collector and a close friend of the late Carroll Shelby; and finally Aaron Shelby, Carroll Shelby’s grandson. 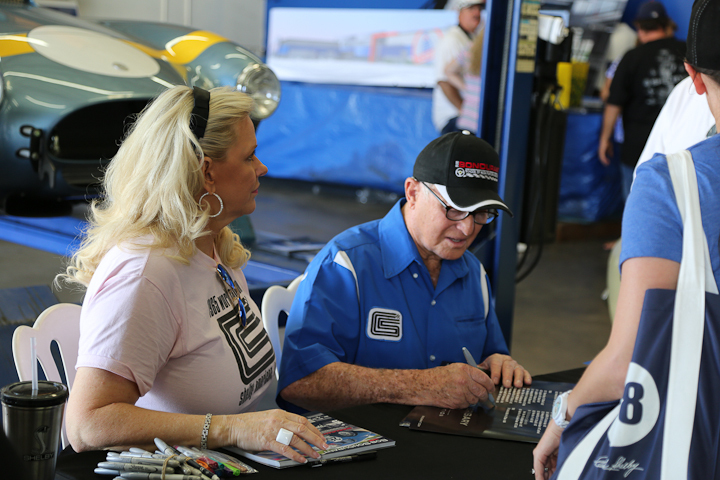 The fans loved hearing the many stories from these individuals. 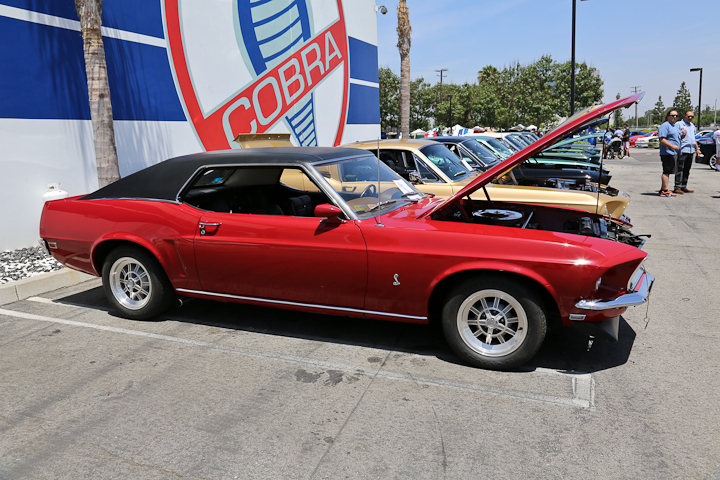 The car show featured over 75 Ford and Shelby offerings including authentic early and current Shelby American cars as well as some very historic Cobras. 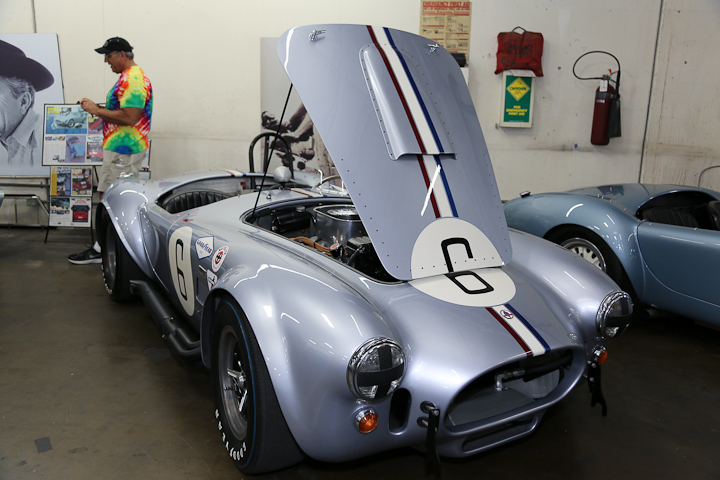 The building which also houses the Shelby American engine shop was full of the authentic Cobras while the outside area contained all the old and current Shelby American offerings as well as “replica” cars including, Cobras, Daytona Cobras, and a GT-40. 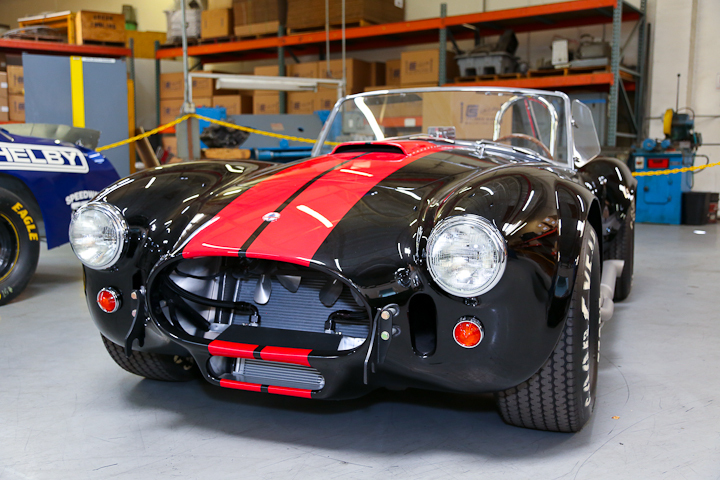 Those historic Cobras included the prototype 260 Cobra CSX2000 that was assembled during one long day and night in 1962 at Dean Moon’s shop in Santa Fe Springs; CSX2005 another 260 Cobra was used exclusively by the Shelby School of High Performance Driving located at Riverside Raceway; CSX2589 the final 289 Cobra built, personally owned by Carroll Shelby until the time of his death; and CSX2299 the 1964 Le Mans winning Daytona Cobra. 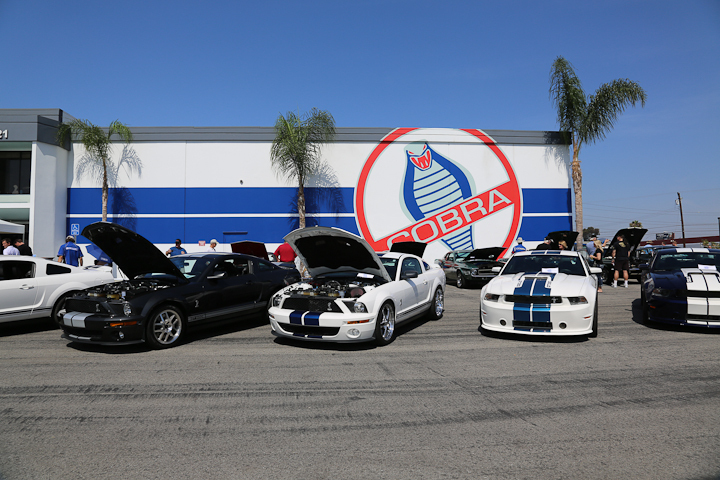 For Cobra fans these can be considered “holy” (images below). 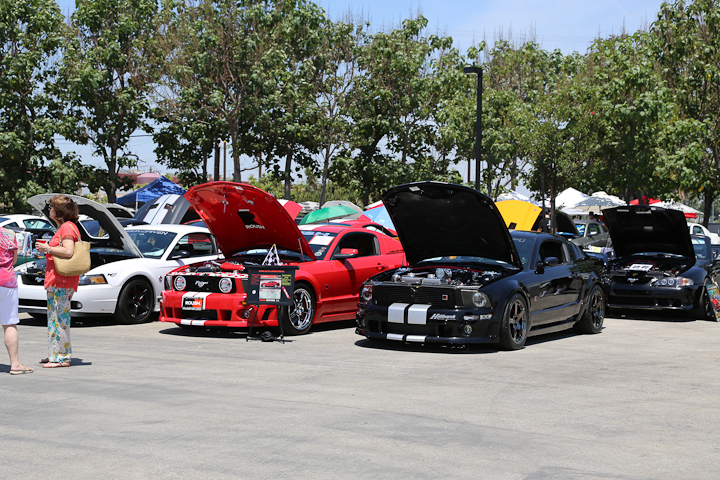 This was a fun filled event and we can now look forward to the 3rd Annual Tribute and car show next spring. 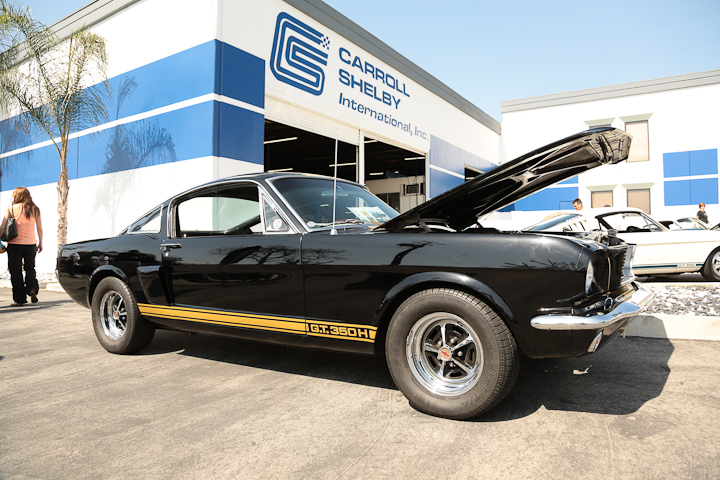 NOTE: The Carroll Hall Shelby Trust unveiled plans for the new Carroll Shelby Automotive Museum (CSAM) at a founder’s reception on May 16, 2014, in Gardena, California. 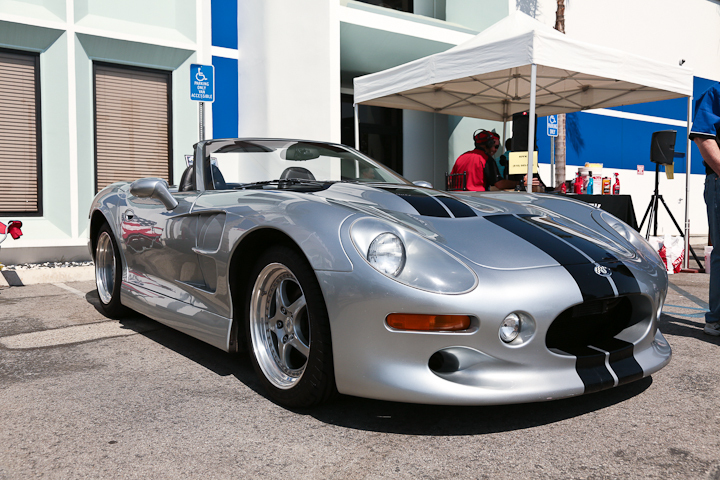 The museum is a 501(c)3 non-profit organization created to educate the public about the high performance automotive industry. The CSAM is being formed by the Trust around the private collection of Mr. Shelby to celebrate his legacy and to inspire future generations. Nostalgia, art, and recycling combine in an efficient use of energy and resources to just get around ... locally. Take a hulk of an electric-powered amusement park and traveling carnival bumper car and turn it into a head-turning conversation piece that can get one easily around for local errands in an artistic style that is more fun than a Smart car, mo-ped scooter, bicycle, or ... skateboard. A man in San Diego got an idea to revive bumper car hulk bodies originally from a ride that use to operate at the infamous Long Beach PIKE Amusement Park and have them become motorized transportation on the go. 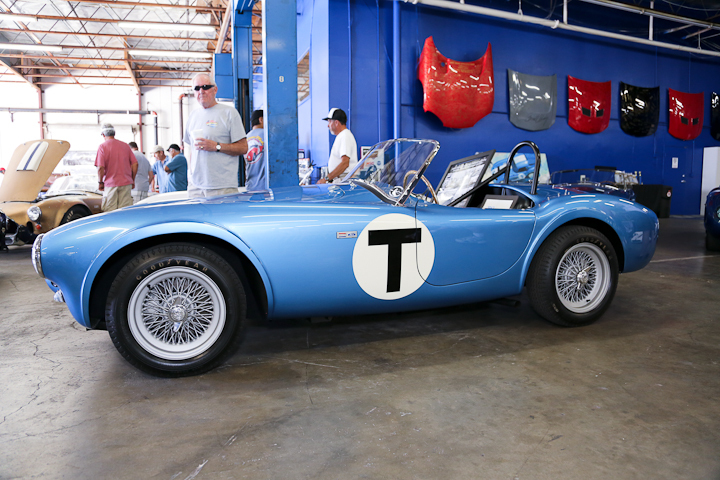 For the past 15 years, San Diegan Tom Wright has turned old bumper cars into street-legal vehicles capable of driving alongside normal cars and SUVs on the highway. Wright's original plan was to remodel one bumper car and put it in the middle of a room in his San Diego home as a piece of art. However, the rush and enjoyment he gained from the work was too much to stop. 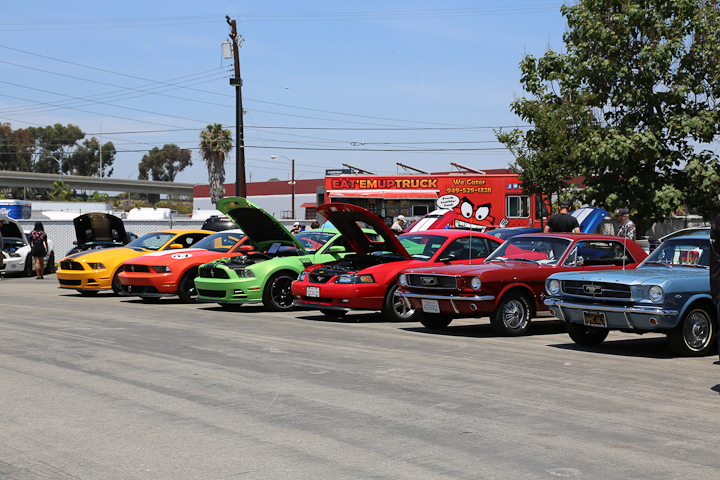 "It's a fun hobby that got a little bit out of control," Wright told KFMB-TV. Fifteen years later, Wright has fixed up nine bumper cars and is working on his 10th project. 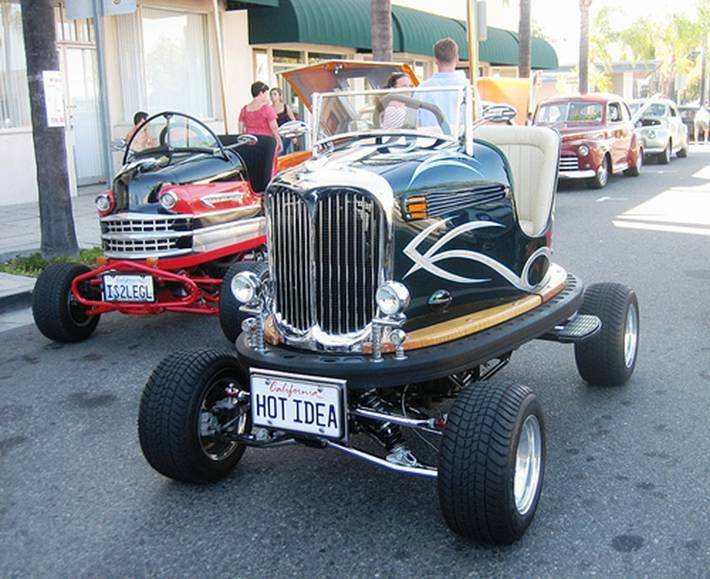 Wright turned his first bumper car into a 1950s yellow hot rod with flames and chrome finish. He has since created several themed bumper cars, including a police car, a woody wagon and a military car with a survival knife as a gear shift and a machine gun hood ornament. Wright's current project is a taxi-themed bumper car with an early-1900s meter. 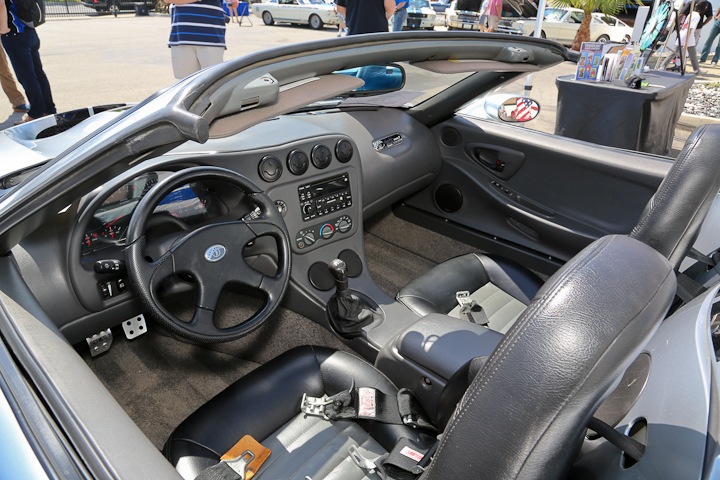 The street-legal bumper cars are powered with Yamaha and Kawasaki engines, enabling Wright to drive up to 50-60 miles per hour. 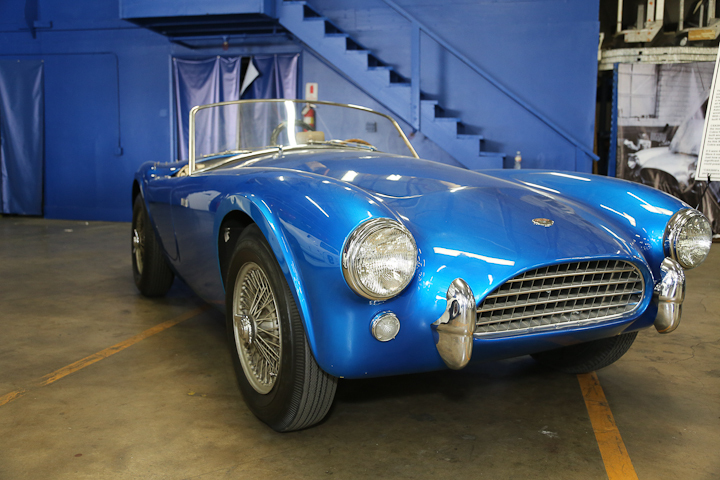 One of Wright's cars reached 132 miles per hour on a dynamometer. However, Wright prefers to drive much slower. "Anything over 50 is beyond scary," Wright told San Diego's KFMB 8-TV. Wright has received multiple offers to buy his bumper cars. However, he says he has no plans to sell them. 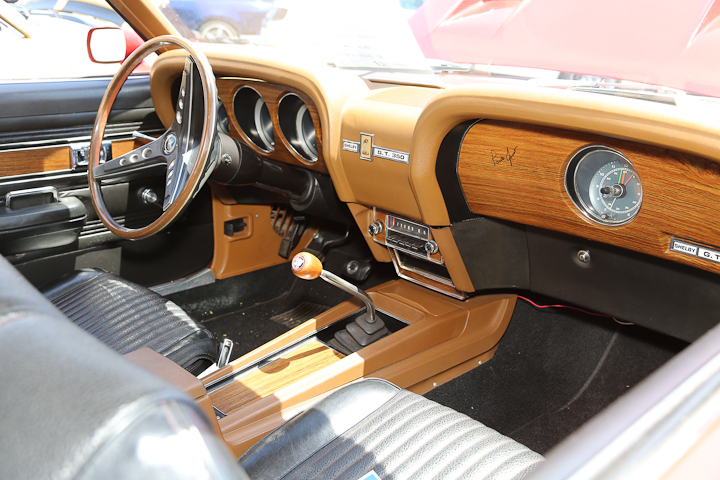 "Got too many hours and busted knuckles putting them together," Wright said. 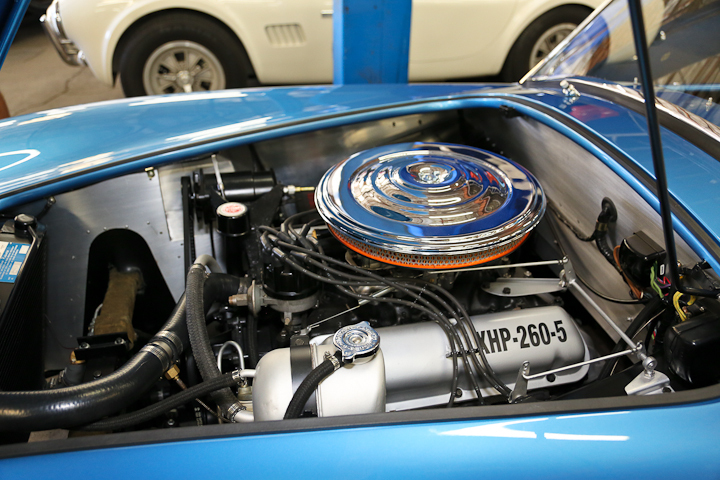 "It's a full-time job keeping them running but that's my hobby. In retirement, that's what I'll do -- keep them running." The first one he created was powered by beefy and vibration-heavy two cylinder Harley Davidson Motorcycle engine. As time went on, Wright saw fit to replace the great sound in favor of smooth running four cylinder Honda or Kawasaki 750cc engine ... and a couple have been measured as capable of 160 MPH, which is terrifyingly fast in machines with such a short wheelbase. 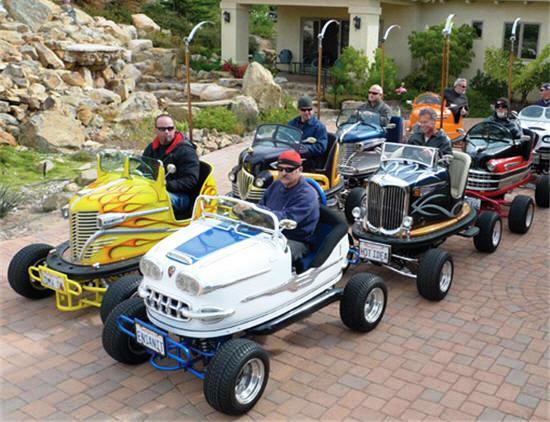 If anyone in the Southern California area would like to see Tom's recycled and converted bumper cars, he will be taking all of them on the road July 4th, 2014. They'll be the featured attraction in Escondido near the corner of Broadway and Grand from 5 p.m. to 9 p.m.
"Outta' My Way ... I'm Comin' Through"! One week after Andretti Autosport served notice that it intends to capture the Verizon IndyCar Series (VICS) championship with its win utilizing a "Flood The Zone" 5-car strategy in the INDY500, Penske Racing answered back in their own 2-race Grand Prix on their own track at the Chevrolet Indy Dual in Detroit doubleheader at Belle Isle. Andretti Autosport rolled into Detroit on a high created by winning one of motor culture's biggest prizes ($2.5 million winner's share) with the highest single race championship points payouts (double) for all the cars that finished - the 98th Indianapolis 500. Andretti Autosport 2012 IndyCar champion Ryan Hunter-Reay beat Penske Racing's 3-time INDY500 champion Helio Castroneves by the second smallest margin (0.06 seconds/about 3 feet separating the end of the DHL DW12 from the trailing Pennzoil DW12) with three additional Andretti Autosport cars landing at P3-Marco Andretti (so, that's two on the podium), P4-Carlos Munoz, and P6-Kurt Busch. Up until about Lap 175 of 200 laps, Andretti Autosport was in contention to place all five cars fielded in the top 10 positions ... that is until a wild restart crash that saw Ed Carpenter in P3, Townsend Bell P4 and James Hinchcliffe at P5 - that had Bell passing, and ahead of Carpenter, who touched Bell, while Hinchcliffe trailed into an inside position setting up an impossible 3-wide competition through Turn-1 - sending Carpenter and Hinchcliffe careening into the wall. Ryan Hunter-Reay came to the Chevrolet Indy Dual in Detroit doubleheader at Belle Isle with a 40 point lead over his closest rival, Will Power. If this weekend were just a single race weekend event, the ability to erase this type of deficit would be nearly impossible. In fact, after the two practice sessions, the lap times the two drivers were logging (Power at P4 with a 1:17.8966 and RHR at P5 with a 1:18.1674 fastest lap) would have one guess that even with two races and double the points being awarded, this would still be a nearly impossible task. It had not been the best build-up to the first race of the Chevrolet Indy Dual in Detroit doubleheader at Belle Isle for Will Power, with Penske president Tim Cindric earlier admitting that the team was struggling to find pace in the #12 car this weekend as they qualified in a lowly 16th position. A few hours later and the car - and driver - were transformed, thanks to tapping Power's team mate and polewinner Helio Castroneves for set-up tips and then by adopting a race strategy that gave them a fighting chance, thanks to a healthy amount of good fortune along the way. Castroneves held the early lead of the race despite struggling to get off the grid for the formation laps, while fellow front row man James Hinchcliffe lost an early duel with Jack Hawksworth down into turn 1. There was an early yellow on lap 5 when Power made contact with Simon Pagenaud: the Australian was distracted by a simultaneous threat to the right from Marco Andretti and ended up pinching Pagenaud into the wall which left the #77 Schmidt Peterson Hamilton Motorsport car in the turn 4 run-off with broken suspension. A few of the cars toward the back of the field - Power among them - opted to pit under the caution, but the leaders stayed out and the race resumed on lap 8. However there was another early caution on lap 15 when Mike Conway understeered into the wall at turn 12 - meaning that both of the 2013 race winners were early retirements this time - and the leaders found it hard to pass up the opportunity to pit under yellow a second time. The two drivers who stayed out were Graham Rahal and Marco Andretti, who duly resumed in the lead ahead of Power and the rest of the cars that had pitted on lap 6 that included Mikhail Aleshin, Ryan Hunter-Reay and Charlie Kimball, while Castroneves found himself down to eighth just ahead of Hinchcliffe. The pit stops cycling through had put Castroneves back out in front when a new caution materialised on lap 36 for Josef Newgarden getting into the tyre barrier and wall at turn 7. The clean-up proved longer than expected because of water that had spilled out of the tyres when they were hit, and that brought the fuel window to reach the finish tantalisingly close - several cars including Ryan Briscoe and Marco Andretti tried pitting under the yellow for fuel top-ups in case the rest of the race ended up with an excess of cautions to make an extreme fuel conservation strategy viable. The leaders stayed off pit road under the caution only to come in shortly afterwards in accordance with their pre-arranged race strategies: Castroneves and Hinchcliffe came in on lap 46 and dropped to 15th and 16th respectively as a result, which ended up removing both from contention for the race win in the latter stages of the race. Effectively the field was now split into three groups of differing strategies: Power led the race ahead of Tony Kanaan and Graham Rahal, all of whom needed to pit shortly and had no intention of easing off their fuel use. From sixth on down was the second group headed by Marco Andretti and Justin Wilson who were going to try and make it home on fumes; and then there were the former leaders Castroneves and Hinchcliffe who led the lack of cars who could make it to the finish but who now lacked track position. Power came in for his final stop on lap 53 with 18 laps remaining, and a fast stop saw him re-emerge just ahead of Andretti. The final ten laps saw Power on the ragged edge as he was forced to apply every bit of his talent to hold off Rahal to the chequered flag. Kanaan was well out of this battle and was five seconds off the pair as Power successfully clinched the win by just 0.3308s from Rahal. "Just a great job by the team, putting me in a position to use our speed," said Power. "It's a massive win. It's a massive win for me, massive win for the team and especially for Roger and for Chevy. They've been trying to win here for a long time and we finally did it with a Honda trying to charge by." "We've been fighting awfully hard to just finish where we have been finishing and so to finally get a result like this it means more than words," said Rahal, who had been suffering a frustrating season up to now in 2014. "That was hard work, very hard work," admitted Power. "I'm very exhausted." Helio Castroneves may have had the fastest car Saturday and, due to some untimely caution flags, he wound up finishing fifth while teammate Will Power came from 16th to first. The three-time Indianapolis 500 winner definitely had the fastest car Sunday afternoon at Belle Isle and nothing could deter him from victory lane. Starting third in the Hitachi Dallara-Chevrolet, Castroneves completed a Penske perfect weekend with a dominating drive in the second of the Chevrolet Dual at Detroit. The 39-year-old veteran took the lead on lap 35, stretched his advantage to 13 seconds and then overcame a couple of late restarts to score the 19th win of his career and tie Rick Mears for 11th on the all-time win list. He led the final 35 laps and was clearly in a class of his own. Power, who made four pits stops and suffered a drive-through penalty for contact with Josef Newgarden on the opening lap, battled back to take second in the Verizon Dallara-Chevrolet. Polesitter Takuma Sato led the first 10 laps in the AJ Foyt Racing Dallara-Honda but as his strategy went awry, he fell back in the pack, got spun by Ryan Briscoe, and eventually tagged the tire wall with five laps left to wind up 18th. Mike Conway, with a first and a third at Detroit a year ago, crashed out of Saturday's race but qualified his Ed Carpenter Racing car fourth Sunday morning. He looked like the only driver with the pace to give Castroneves fits but a long stint on fading optional tires was not the way to go, and he plummeted down the field. He finished 11th. Indy winner Ryan Hunter-Reay suffered through a miserable weekend. He crashed in qualifying Saturday and finished 16th in the first race. He smacked the wall in almost the same place Sunday on his first flying lap, started 21st and dropped out in 19th place with ECU failure. With Penske Racing holding down the top two positions in the championship points race over Andretti Autosport's Ryan Hunter-Reay in P3, Schmidt Peterson Motorsports' Simon Pagenaud P4, and Andretti Autosport's Marco Andretti P5, one has to get past Andretti's Rookie Carlos Munoz and Penske's Juan Montoya before reaching any Target Chip Ganassi driver. Last year's IndyCar champion Scott Dixon sits behind seven other drivers after seven races with eleven races to go ... just not the right direction for Scott or Chip. Next weekend the Verizon IndyCar Series takes the show to the high banked tri-oval turns in Fort Worth, Texas, site of the most close finishes in IndyCar where Helio Castroneves grabbed onto, and held the championship points lead until the last race at Auto Club Speedway in Fontana last year. This weekend saw Power take on the role of the villain, the masked avenger who made contact with Pagenaud on Saturday (no penalty, just as he also did not receive one in Long Beach) but did make contact with Josef Newgarden and Graham Rahal on Sunday (which did trigger a penalty). Meanwhile Castroneves came out revitalized with arguably his best weekend in the series in years. He’s won races with the DW12 before, yes, but not with as much “he’s still got it” pace and gusto as he delivered both races this weekend, particularly Sunday. It was a seriously impressive mental bounce back after losing out in Indy. Power’s mind has long been hard to decipher. He’s consistently been IndyCar’s out-and-out fastest driver since he joined Team Penske, but he’s never been fully able to keep it all together over the course of the season, and hasn’t yet captured an elusive championship. This year, he’s not making any friends, and he’s not focusing on points – only on driving the best he can every race. It remains to be seen whether that mindset will ultimately pay dividends. Hunter-Reay is arguably IndyCar’s most versatile driver, as he excels on any of road courses, short ovals and big ovals. If he has even the tiniest of weak points, it’s on street courses, where he’s been plagued either by mechanical issues or slight mistakes the last year and a half. After Indy, RHR had a weekend nearly as bad as AJ Allmendinger’s last year in Detroit, and now must find a way to recover in Texas. Pagenaud and Dixon are similar in that they both have a seriously steely resolve and exterior, and haven’t let issues get to them this year, at least publicly. Dixon’s Sunday drive from 22nd and last to fourth was one of those classic “don’t forget how good the Iceman/defending champion is” type-performances. Pagenaud, too, came back on Sunday following a rough Friday and Saturday. What about Castroneves? He might have the best mindset going forward. At 39, he’s closer to the end of his career than the beginning. He nails the game outside of the cockpit; he’s still IndyCar’s most recognizable star on a national level and he’s won everything he’s ever needed to in IndyCar. Except, of course, that elusive first championship. The Brazilian is basically IndyCar’s walking, talking version of Pharrell’s “Happy!” but there’s still a burning desire to be the best when he straps his helmet on. He’s driving so much calmer, cooler and consistently than he was three years ago. If Power and/or Hunter-Reay self-destruct around him, Dixon can’t make up the 140-plus point deficit (he’s 142 back now, and we’ll know likely by Pocono whether he still has a shot) and Pagenaud isn’t consistent enough to match the “big teams,” Castroneves may well samba into this year’s title. Marco Andretti’s the remaining driver in the top five still with a shot at the title, but he’s at the point where he has to win – particularly at Pocono, given double points there – before you can really begin to factor him into title contention. Given his results consistency level though, you can’t rule him out of it, either. How drivers and teams manage this summer stretch, both on-track and in their heads, will be fascinating to watch.